We are sure that you have tried many wifi analyzer apps and that they didn’t work very well. Well, we recently discovered a quite new WiFi analyzer app which literally blew our minds. Home WiFi Alert- WiFi Analyzer is 100 percent effective and offers a great value to any Android user who needs an app to protect his network from thieves. The connection stealing and many people on your WiFi that you pay for, can slow down your connection and unable you to surf online fast. If you want to secure your home connection, you can do that by first downloading this network analyzer app. You can secure your home router with the link in the settings menu and log-in in order to configure your own network settings. Home WiFi Alert is a fast analyzer for any kind of WiFi theft. With its help, you can now see everyone who tries to steal your connection and some of their personal information, like their IPs, host name, MAC address, and manufacturer name. It will all be listed for you. The app will also notify you wherever someone tries to interrupt your WiFi – there are vibrations and message alerts included. 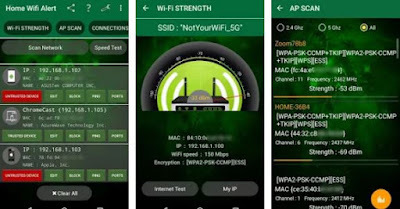 With this many features, we can conclude that this app is the best tool for WiFi analyzing which makes it the most useful one available on Google Play. There, it is free for download. Do you like playing on slot machines? Maybe you want you’ve wanted to play in real life, but decided that gambling with real money just wasn’t your thing? Well we’re here to share with you the best slot machine game you could ever dream of! The Irish Gold Eyes Slot Machines game app is meant to simulate real casino games, without the need for you to spend any money while playing it. Like we said, this game doesn’t ask of you to spend any money on it, and so it is 100% free. The game gives you bonus coins every hour, and has tons of fun and interactive bonus games. You can even use the auto-spin button for easy, laid back gameplay. It has some of the coolest sounds, graphics and interface that have ever been put on a game like this. The game has instant accessibility from anywhere, at any time and from any device. You can even play it without a network or a Wi-Fi connection, which makes it a cool game to play while staying offline. So what are you waiting for? Download this amazing free game and grab your pot of gold immediately! You can find and download it on the App Store. 3 Pointers is relatively a new game app that we would like to talk about today. Being the most unique basketball game online, it quickly climbed up between the top rated games in the Sports category. It is filled with original and fun features, great backgrounds and really challenging gameplay. Those are not all of the reasons why we decided to share it with you today - our whole team is fully addicted to it! The gameplay is placed in different backgrounds, it is up to you where it will be. You can choose from 10 various backgrounds and also pick the color you desire for your ball, there are plenty fun colors to choose from. The basketball game lasts only 3 minutes and it is set in only one level. This doesn't mean that the game is boring, actually the ticking clock makes it even more challenging. 3 Pointers includes extra time rewards, for example if you make any shot in the last 20 seconds, you will receive another 20. Also, if you succeed to make nothing but a net show, there will be 20 more seconds added to your time. You will be able to check out your high scores and try to beat the other users' scores with the help of the leaderboard. There is a girl talking as well. She will try to motivate you or try to annoy you, it depends on your shots and scores. If you lose, you can always play again - there is an endless repeat button. Play and have fun with the best basketball game which is free for download on Google Play and on the App Store. We know how fun Trivia games can be. But they are all getting boring with their similar graphics and gameplays. But, don't worry - we are about to present to you a quite new trivia game on the platforms iOS and Android. It is called Kwyzzislands and it is full with exciting features, amazing gameplay and lots of fun questions. Starting the game will make you amazed by everything that is in there. You have two guides, Ellen and Dougie, who will take you to your trivia adventure. They will show you how everything works and how to begin. You can see that there are multiple islands, each of them with different names: general, entertainment, sports, music, movies, kids, and people and places. Once you've picked your desired field, you will start to play the first level of the many. The game will offer boxes with questions and they all give you points if you guess them right. Collect the needed points to pass the level and go to the next one. 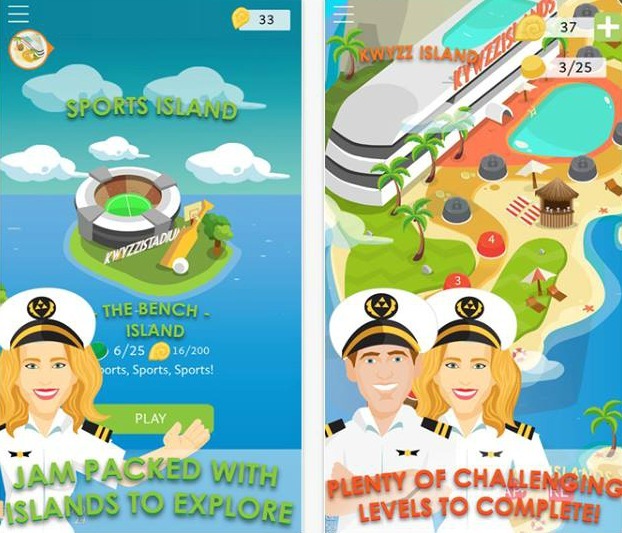 Kwyzzislands has thousands of trivia questions which are challenging and the level progression more exciting. You can get some help if you want to, with the hints and other help options. Complete more and more islands and have fun along the way. Download this cool game for free on Google Play and on the App Store. Can you name all the 50 states of the US? Of course you can’t, unless you’re one of those rare geography geeks out there. Well if you can’t name those pesky states, you have to check out this amazing game app! 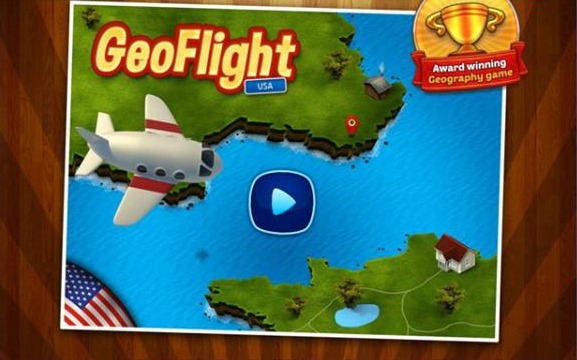 GeoFlight USA Free: Geography is a fun and addictive game focused on geography. It’s highly educational, which is great if you want to improve your knowledge for school and education, the fun way. GeoFlight USA is a fun geography game that helps you learn United States cities, states and capitals. The game has multiple game modes through which you can learn all that you need. - Practice Mode, where you learn and practice all of the states, cities and capitals in your own timeline. - Time Race, where you race against the clock and name as many destinations as you can within a time period. - Multiple Choice, where you need to give as many correct answers as you can. GeoFlight USA has a scoreboard where it keeps track of you and your friends’ and family’s score, encouraging you to be the most knowledgeable person in geography in your surroundings. You can get this amazing, fun and addictive game for free on Google Play. If you want to find your perfect internship program, here is an app that will definitely help you. 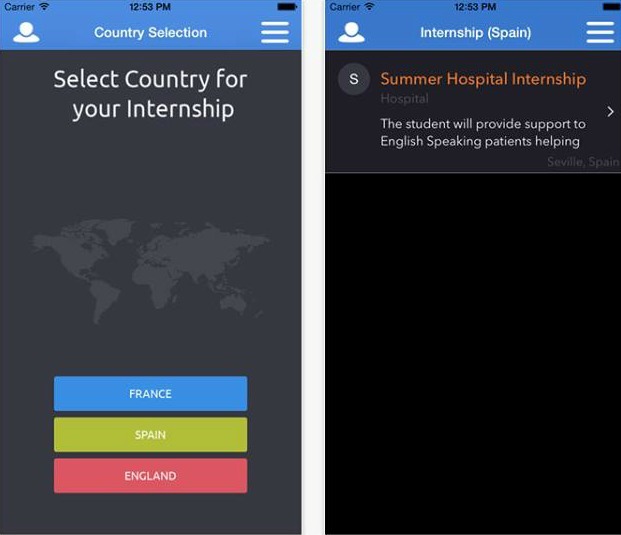 Intern Place is an app that offers students across the world to get the opportunity to explore different career training and education, related to their field of study. It is available on both of the platforms - IOS and Android and designed in a very smooth way, with unique features and graphics as well. The internship programs that Intern Place contains are divided in three main European cities: Paris, Barcelona and London. You can open the three programs within the app and read what they are all offering. When you select one of these, you will be able to find out all the details - description, requirements, duration of the programs, and have the chance to apply immediately. Applying is also an easy process, just fill the blanks with your information and pay one flat fee via PayPal. The waiting of the response is not a long process. It only takes approximately 4 weeks until you receive an offer and Intern Place will arrange you a Skype interview. It is the best first step on the scale of becoming an intern abroad student. Download this beneficial and divine app for free on Google Play and on the App Store. Finding the perfect gifts for your family members and friends can be quite a challenge. Having that in mind, a team of developers created an incredible app - GiftBuster, and made it one of the top apps in the Lifestyle category. 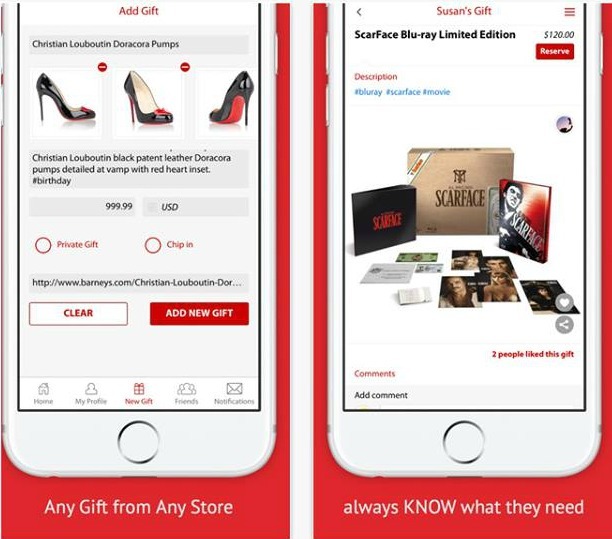 Available for the iOS users, it has very useful features which will help you with doing the right choice when buying a gift. Before you begin, we would like to shortly explain how the app works. The first thing you have to do is sign up and make a profile where you can share your wish list and see your friends' wish lists too. There, you can upload photos and places where to buy the specified item. Your friends can see this and they can buy you your desired item for any occasion. But if you want to buy something for someone, you will have to reserve the gift and then go to buy it in person. The app also offers birthday reminders one week in advance. Make sure to unreserve things you don't buy for your friends, so other people can do that instead. The chip in feature can help you buy a last minute gift and to a long distanced friends and family. Invite them so you can all have fun and buy each other amazing gifts for any kind of an occasion. You can download this extraordinary app for free on the App Store. What is the most effective gaming mouse to buy? 7:05 PM Best Gaming Mouse, Gaming Mouse, What is the most effective gaming mouse to buy? Perfect Price for A Gaming Mouse? What is the most effective gaming mouse to buy? Finding the characteristics of the best gaming mouse? What is the perfect price for a gaming mouse? If you're a computer game player who largely plays via your computer, chances are you own a mouse. though PC gamers own mice, not all of them own mice that are suited to pc gaming. There are several gaming mice on the market and every one of them is completely different in bound key parts. for instance, you'll purchase a mean gaming mouse. This mouse can have characteristics of lower latency, the mouse can support the higher resolution or DPI settings, associate with a higher software package and also the mouse will use completely different sensors to stay with the quicker movements old once someone is taking part in a computer game. however what's the most effective gaming mouse to buy? Generally, the best gaming mouse to you isn't the most effective gaming mouse to a different person. However, the most effective gaming wireless mouse is one that has a superb optical sensing element. If a mouse doesn't have a decent optical sensing element, it'll be troublesome for the mouse to stay up with the movements you create once taking part in laptop games. A gaming mouse to buy is one with a perfect form. It ought to facilitate claw or palm grips or ought to typically associate with completely different hand sizes. The mouse ought to con jointly associate with nice software package. The software package ought to be customizable to confirm that you just will set its sensitivity to match your movements. A great mouse like the Logitech mouse ought to have a good value. gaming mice come back at completely different costs. the costs will begin from as low as $10 and attend as high as $130. however once gazing the worth of the mouse, forever contemplate its overall quality. Secondly, a gaming mouse is also low cost or costly supported the options it offers. Therefore, contemplate a mouse with options that are essential to your gaming desires. however a rule of thumb is to confirm you're buying an inexpensive mouse. When we find some amazing game on Google Play, you all know that we like to share it and tell you about our experience. 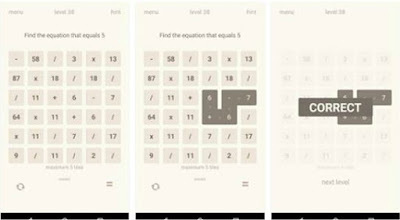 This time we have the perfect puzzle game for all of you – Math on Tiles. It is created in a very challenging way and is can be played by both children and adults. The graphics and the gameplay are really remarkable as well. When you start Math on Tiles, it goes full screen right away. The first thing you see is the menu, where you have the choice to learn how to play with the “instructions” button or enable or disable the sound effects with the tip of your finger with the “option” button. Pressing play will get you to the board with tiles and numbers. You have to find an equation that is asked of you, with finding and connecting the right numbers. There are 300 levels for completing and 4 different difficulty levels: very easy, easy, difficult and genius. According to these names, you can see that it gets harder and more challengeable the more you play it. Hints are also amazing feature of this game. You can get 10 hints with downloading the free version or get limitless hints with purchasing the app. With simple app design that is easy on your eyes, you can enjoy playing it for hours, because it is very addictive. Download it on Google Play. Coin Dozer games are really frequent nowadays. The one we will present today - Splashy Cashy Coin Dozer Fever is simple enough to grasp and play, but hard to master. It has quickly become one of our favorite coin dozer games and that is why we decided to present it to our readers. If you’re having a really boring day and you don’t have nothing to do with your free time, you may as well download this awesome game we’re about to show you. It is called Sleepwalking Scientist and it is one of the best games of 2016, we assure you. Get ready to be amazed by its unique and addictive gameplay, original character and fun music and sound effects. 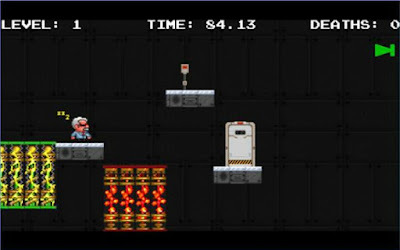 The Sleeping Scientist is a puzzle platform game with a unique storyline. The main character is the scientist who happens to fall asleep in his laboratory. Your goal is to help him get to his bed. While doing that, you must avoid the obstacles that come in your way. If you tap on the left half of your touch screen, you will move the tesla towers – the green ones. If you tap on the right half of your touch screen, you will move the inferno towers – the red ones. Try not to hit them, or even touch them, they carry a certain dead to your sleepwalking scientist. You can read the instructions within the “how to play” option the game features. You will also be able to make your own high scores under your own username and check them on the leaderboards. Turning on and off the music and the sound effects are also under your control. The different levels offer various features, so be sure to find the right path. Download this incredibly fun game for free on Google Play. Wordplay is one of the hottest word games developed by Bhavik Upadhyaya. We all know what a word game can offer – a huge entertainment and enlarging your vocabulary with a simple and challenging gameplay. If you are a word game lover, Wordplay is a must. Designed with wonderful graphics and neat UI, it enables you to have fun and learn new words as well. 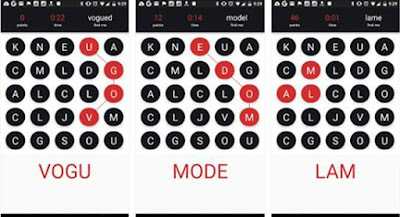 The gameplay is based on forming words with the tip of your finger. You slide across the grid on your screen in order to form words – backwards, forwards, sideways, etc. It may sound simple, but it isn’t. You have the time ticking, meaning you only have 30 seconds to find and guess as many words as you can. Finding the words will bring you points. Each word has a different point value, you will see your results and see how you did. No worries, the game features endless replay option. Without online competing with other people, you can enjoy yourself and try to get new high scores. With soon upcoming new features, it is the best free word search puzzle in English. 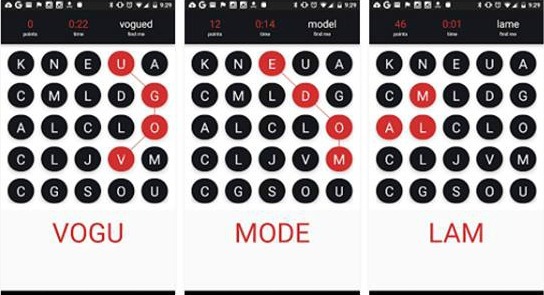 Exposing yourself enough longer to this incredible word game, you will definitely improve your vocabulary and stay entertained no matter where you are. You can download this easy to learn and play game for free on Google Play. The goal of this amazingly created app that we’re about to show you are extremely helpful for anyone who wants to keep track of the daily calorie intake. Daily Intake is developed by Daily Intake Inc and it is designed to follow your weight loss journey and offers motivation to live a healthier and happier life. The features of this app deliver amazing benefits to any customer. In here, you can find the motivation you need with just simply customizing your screen with whatever you want. You will make a personal profile where you can add your intakes and see how much you’ve eaten, and see if it is the proper quantity and proportion for you. The best thing about Daily Intake is that it contains nutritional information about 92% of all the food items in both U.S and Canada. The food items are from 20.000 different brands and it also includes whole updated menus with over 100.000 food items from hundreds of restaurant chains. 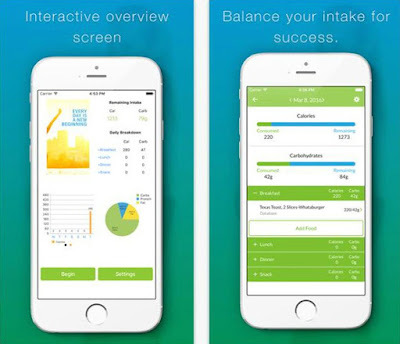 The app has a very clean and tidy interface, simple and easy design and is an excellent tracker of the carbohydrates and calories you’re taking in with your food every day. It will provide you with health, emotional and physical improvements. You can buy the pro version for $2.99 or download it for free on the App Store. If you’re looking for an awesome game to play and to keep yourself entertained, look no further! We have the perfect time killer – Color Swap. It is one of those games which will keep you addicted to the fullest. We can say that from experience, we played it without stopping. The developer team, KanKos Labs, put such an effort in making this game suitable and fun for any age. Color Swap is an amazing game with more amazing gameplay. It offers multiple features and the whole combination of those is what makes it so addictive and unique. When you start the game you will be amazed immediately. The colorful menu includes a sound button (on/off) and a play button. When you press play, it will offer a quick tutorial and then it’s show time! Show your skills with your jumping character. You have to pass through the multiple colored circles on your way, but only through the parts that share the same color as you. 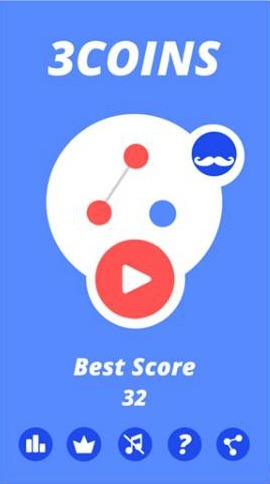 You need to tap on the screen, but not to slow, because you will fall down or not too fast, because you will bump into the wrong color. You will be able to collect many power-ups in order to switch the color of your character, as well. Download this one of a kind game for free on Google Play. If you are looking for an ideal app for managing stress and relaxation, we have the perfect one for you. We present to you Bubble Therapy, a quite new app for the iOS platform with a unique design and wonderful sound effects which can calm anyone and anywhere. The app is designed by the developer team Octofly, LLC and it is available for both iPhone and iPad. The name of the game says it all. All you have to do is download this amazing and original app and let it get to you. When you start it, you will see the comforting and tranquilizing light blue theme which immediately calms your eyes. The goal of the app is to offer a fun and easy way to kill your stress or just to make the time pass faster and more interestingly. All over the blue theme there are many transparent bubbles. You will have the opportunity to pop them endlessly which we think is extremely helpful. 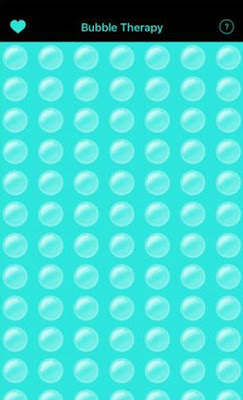 With overwhelming soothing design and original sounds, Bubble Therapy will make you fully enjoy popping the little bubbles. If you see the users’ reviews you will see that we are right. Actually, see for yourself by downloading this one of a king app. It is free on the App Store. If you think you should hide your IP and surf the web anonymously you are having the right thoughts. A vast majority of people want to hide IP address because they think it will give them anonymity on the internet and keep hackers from hacking their computer. That couldn't be further from the truth. Hiding your real IP address via encryption, allows you to be anonymous when browsing online. There are many different software that hide IPs. However, the one we will talk about today, Persona Tool, is different. With simple words Persona Tool is a proxy-based browser with "Settings per Persona" in which you can store and use specific profiles per User Identity and location you want. It is available for both Mac, Linux and Windows. Persona tool can be easily downloaded and signed up for on the official website. You will get 3-day trial account to test the software. When you download and install the software you will get a modern, stylish and smooth browser on which you have to sign in with your account details. The proxy and the browsers run on the best cloud providers and that is why the speed is amazing. We are talking about cloud providers like AWS, Google Cloud and Amazon Web Services. We have used it for several days and the speed is maybe one of its best features. Simply, you won’t feel like you are on a proxy. The browser, or Chromium browser as they call it, is based on NWJS.io. This tool works with NodeJS and that is why the browser is so powerful. There are several locations from which you can create profiles and login from. You can create profiles for each location. Yes, this Proxy/VPN service keeps logs for each profile and location, but the great thing is that you can clean the history and delete the log files permanently. Design wise, the software looks neat and is organized smartly. It is also intuitive and easy to use. The software is stable and we recommend testing it for few days. We are more than impressed with it, mostly by the speed, but also because of the fact that it can create and save profiles for each location. On top of that you can control the log files and delete the history and the log files at any time. Try it on a 3-day trial here. 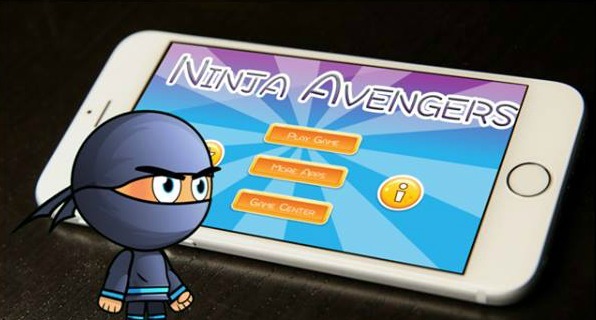 Searching through the App Store, our team discovered one of the best games ever, called Ninja Avengers. It is created in a very fun and challenging way, it will simply glue your hands to your iOS device. This arcade game will thrill you with its one of a kind gameplay, wonderful design and original soundtrack. With one of the coolest characters ever, the gameplay is created in a unique way and it will amaze you with the upcoming challenges of every level you achieve. Try to tap on your screen as fast as you can and make the ninja fly. Avoiding the barriers that are cutting your way is also one of your goals. Try not to bump into them so you can win the level and try again with the next one, and so on. Ninja Avengers features 10 levels, each one made especially for testing your skills. Also, there are 3 difficulties that you can choose from – easy, medium and hard. You have to save your life the best way you can with using all the tools the game offers. While flying, try collecting the coins in your way and double them whenever you see fit. Play without stopping, unlock new levels and share your high scores on other social networks in order to challenge your friends. 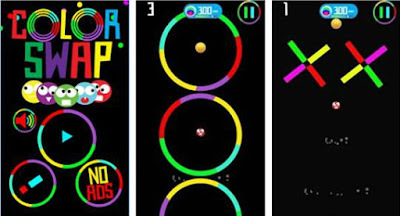 Have the greatest fun you’ve ever had with this stunning arcade game with downloading it for only $0.99 on the App Store. If you’re looking for an app that will offer tips about using essential oils and guide you through the aromatherapy process, look no more because we have the best one right here and it is called Essential Oils. Learn quickly and easily about how essential oils can naturally help you improve your health and well-being. 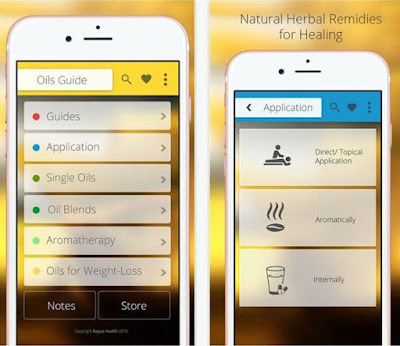 Get the perfect guidance on the therapeutic use of essential oils with this stunning iOS app. Divided in different sections and containing multiple functions, the app offers easy and simple access to the powerful healing benefits of the essential oils – anytime and anywhere you are. The functions include search bar, favorite button, add note option and even a store, where you can look and purchase a real essential oil. The uses and benefits of the essential oils can be seen on the main menu, arranged in colorful and interesting 6 sections: guides, application, single oils, oil blends, aromatherapy, and weight loss oils. According to these names, you can find out anything you want without a problem. Let the app guide you with the first section, through all of the real benefits of the oils and teach you how to apply them with the second section. Learn about what single oils and oil blends, how to use them and their benefits in details. Aromatherapy is the term for using essential oils for therapies, so find out how to practice it with the fifth section of this app. The last one includes tips and names of essential oils and how you can use them for losing weight. Essential Oils app includes more than anyone could ever expect. It is beautifully designed and it is free of charge. Download it on the App Store. For all the game lovers, here is the most addictive and fun game on the App Store. Feed My Pony is a quite new game, developed by App Insomnia Ltd and it offers hours of entertainment. Get lost in the wonderful gameplay which is appealing for all ages. Besides, it has very attractive design and it is easy to learn and play. The gameplay demands your physics skills and knowledge, so you can predict the falling of the apples. The main character which you play with is the little adorable pony and your task is to feed him the apples. Being non-reachable for the tiny creature, your goal is to cut the proper rope that you think will make the apple fall closest to the tiny horse. Show your skills and predict the falls of the apples, don’t keep your little pony hungry. There are 100 levels, so with playing, you will be able to open new levels and have even more fun! Feed My Pony also features original sound effects and music and blasting colorful graphics. The game requires iOS 6.0 or later and is compatible with iPhone, iPad, and iPod touch, meaning you will be able to play anywhere and anytime you want. The multiple leveling and the challengeable gameplay can attract anyone and make anyone to have hours of fun. Download this outstanding game for free on the App Store. Have you ever wanted to play a game which allows spinning casino slots? Treasures of Egypt - a relatively new app, now available for any iOS user, gives you that wonderful opportunity. This is so far the best slot gambling game on the App Store and it provides with endless spins and endless fun. If you are looking for enjoyable casino app, this is the one for you. This thrilling game has multiple features that make it so interesting for the customers. You can easily learn how to play and the best thing about it is the fact that this amazing game does not require internet access. That way you will be able to play both online and offline. The game can be played on 5 reels and there is even a manual reel stop. The reel spins are fast as they can be. Play and earn free spins and have more fun. Collecting more coins is also possible with the help of different bonus games this app features. If you press long enough on the spin button, it will enable the auto play, when the machine slot spins itself. Besides the simple and easy use, Treasures of Egypt has unique design and amazing presentations and original sound effects. It also frequently updates and upgrades, so you can keep up with everything new. 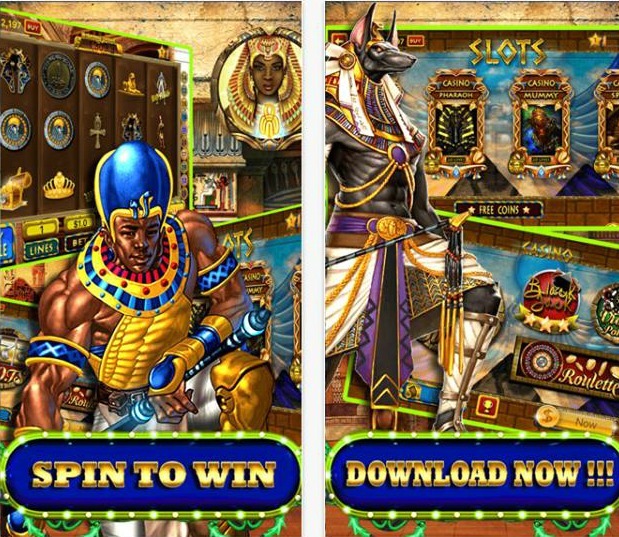 Earn coins with this casino gambling game and maybe you’ll win the jackpot! Download it for free on the App Store. We recently heard and read about a new developed app called Seeblings and how amazing it is, so we decided to check it and see what it is about and why all its customers are crazy about it. We have to agree with them – this app is so unique and creatively made, that we immediately wanted to share the experience with all of you out there. 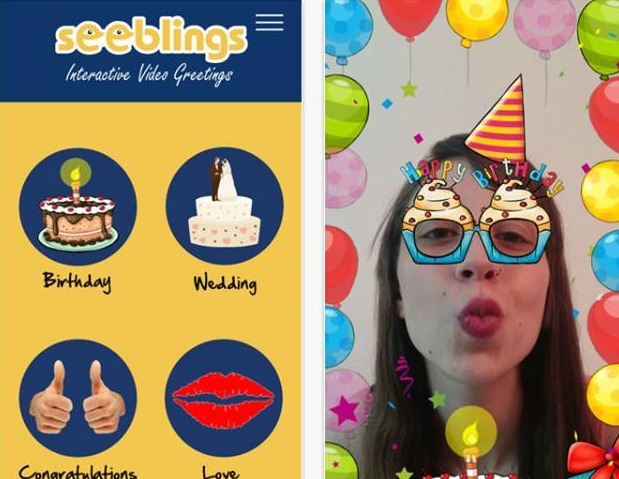 Seeblings is an entertainment app which allows its users to create original and astonishing video greetings and share them with family and friends. Besides, it is very simple to use app, just pick the theme and design, record the video and send it to your loved ones. Opening the app will offer you a choice between making videos for 4 different occasions: birthday, wedding, congratulations or love. Choose the one you need and start making the video with the theme you want and the design you want. You can add background music to make it more appealing and add some of the app’s frames which are activated by touch or voice detector. You can try and draw over the video and attach some of the superimposed items on your face (glasses, candles, hats) through face tracking. The recorded video greeting is quickly shareable on different social networks: Facebook, Twitter, Whatsapp, Google+ and e-mail. Create a unique greeting and send it to someone special – we can assure you they will never forget it. The app is free for download on the App Store and it is coming on Google play soon. If you haven’t found this amazing app on Google Play yet, we are here to share our experience, because we couldn’t stop playing it. Let’s Build a Wall is relatively new action game and anyone who is an Android user can have fun with it. According to the customers and their reviews, they immediately loved the game just like we did and became a part of their daily routine. The story and the gameplay of the game overwhelms with uniqueness and fun characters. The story is set in the peaceful and loving world of Ugabuga where the citizens live in a perfect harmony. Everything is great until the alien came and started to attack the land and try to occupy it. The people want to fight back and they need someone in charge. Here comes your character, Arnold Stump, who is armed with multiple cool weapons and powerful abilities to stop the aliens from destroying Ugabuga. Your goal is to help Arnold process his solution to the problem. Build a wall which will stop the aliens from invading his land. 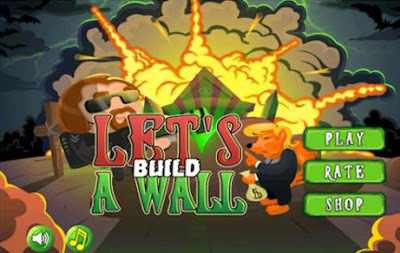 Let’s Build a Wall is one of a kind action game and is what we all needed on the Android platform. Full with amazing graphics, colorful backgrounds and entertaining sound effects and music, this game will make you enjoy your device anywhere and anytime. It is free for download on Google Play. We all live in the era of internet and smart phones where everything we need is available, even cooking recipes. Although there is some kind of competition on this field, you won’t find an app like CC CopyCat Recipe Collection, not even similar with it. Compatible with any Android device, this app is full with tons of recipes that will make your cooking easier and better. The recipe collection contains 650 recipes and more, which makes this app unique and original. If you are willing to cook, you can find any kind of recipe in here, from chicken preparations, to salads, sauces, soups, cakes, cupcakes, pizzas, brownies, ice creams, smoothies, and much more. Featuring so many recipes, the developer team arranged them alphabetically to make it easier for you and also placed a search bar – you can see it on the top of the display. There, you will be able to search by name or category and find whatever you want to cook. Clicking on the white arrow of the desired recipe will lead you to the cooking instructions and the exact quantity of the needed ingredients. Assembling the best recipes in the world, the app can give you ideas for cooking and help you through the process. Download this amazing app for free on Google Play. 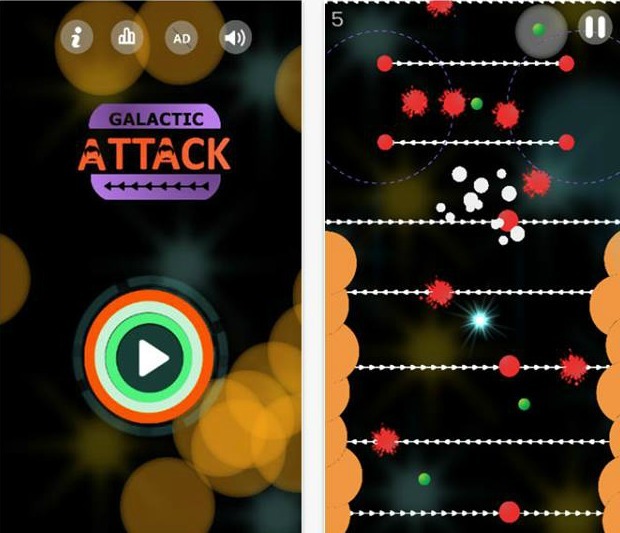 Galactic Attack 5th Star is relatively new game app on the App Store, created by Chelsea Lindsay and it has impressed everyone who played it. That is why recommend it to you today, so you can have fun with this fresh and unique game. It will attach your hands to your iOS device and get under your skin, challenge you to the fullest and amaze you with its original graphics and sounds. Besides the wonderful graphics and interesting music, the gameplay of Galactic Attack 5th Star is full with unique characters and goals. Opening the main menu will show you two options: how to play and tap to play. How to play will explain everything about the gameplay and tapping to play will open the galactic universe full with all of the colorful stars. You play with the purple one and your goal is to stay on the white lines and jump from one to another as fast as you can. Try not to hit the red stars and collect the green ones while you play to unlock even more new and amazing characters. Hitting the walls (the ends of your screen) will also make your star explode and the game will restart. Galactic Attack 5th Star has a really easy setup, it will challenge you to get higher scores and it only requires iOS 6.0 or later. Compatible with iPhone, iPad, and iPod touch, this unique cool game is free for download on the App Store. If you are a huge indie music fan or an unsigned and individualistic indie musician, TripleVMusic is the perfect support for you. It is the most unique music promotion app that will definitely uncover your music if you’re a musician or enable you to vote for your favorite musician or single if you’re an indie music fan. 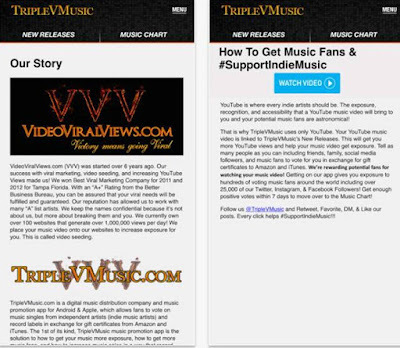 TripleVMusic is the answer for supporting the indie music. To use this amazing app, all you need is an iOS or Android device with internet connection. With no other requirements, TripleVMusic allows you to vote for your favorite songs with the free gift cards from Amazon and iTunes, read what other fans think about the music, express your opinion and receive more cool rewards. There are 2 charts on the menu: New Releases and Music Chart. The first one is showing all the new submitted singles which you can vote for and the other one contains the top 10 artists. You can vote for your favorite artist so he can make it to the top 10 or if he’s already in the top 10, vote so he can climb to the first position. Register, login, follow the instructions, submit your video, follow your votes and redeem the points to get even more gift cards rewards. You have the chance to change the music industry and decide which song will be popular. Download this incredible app for free, on both Google Play and App Store. If you want to have all the relevant data about each country in the world, then downloading the educational Android app - World Countries is a smart move. It is an educational geography app that that features great design and lovely organization of useful data. The content it offers can be highly beneficial and useful to users. HIV is one of the harshest health conditions human can face nowadays. Not only that having HIV is scary, but on top of that the ones that have are having huge problems dating and meeting new people. In order to help to tackle this problem, today we will present you an app that can help HIV positive people to socialize, find friends and date. We are talking about the Android app called HIV Aids Dating.It is an app of the major dating network for AIDS and HIV individuals. Today, we are happy to present to you this board game app on Google Play that will make you enjoy your Android device even more. It is called Solitaire Universe and it is based on the classic game we all know, the Peg Solitaire. With 12 different layouts, beautifully designed and easy to play, this game is on the top of the list of board games, at least that’s what the users and their reviews are saying. The aim of the game is to clear the game board by sliding pegs and to be left with only one peg. That’s how you win. You can make a choice whether you want to play an easy mode that includes diagonal moves or normal mode where only horizontal and vertical moves are available. Before you begin, if you don’t know how to play there’s a instruction button and it explains everything we’re about to. Tap on one peg and when it becomes highlighted you can move to one of the empty spaces on the board by sliding it there. The empty space will highlight itself in green color. The moved peg will be removed from the board and by removing all but one peg, you win the game. Making wrong move can be fixed with the multi-level undo system. You can track the wins and the losses stats for each board layout, for both easy and normal mode. Aim for higher achievements while having fun, only with this unique board game on Google Play. It is free for download. Searching for a wallpaper app that will make your Android device much more compelling and beautiful? Well you should definitely try the app that has everything needed to help you achieve that. We are talking about the lovely wallpaper app called Wallhab – Tempting Wallpapers. Recently introduced on Google Play, this app gained positive feedback and critical acclaim quickly. This was mostly because the amazing selection of wallpapers with outstanding quality. Everything within the app is intuitive, smooth and fast. The sleek design makes the app even more enjoyable to use. The wallpapers are divided in different categories. There is not much to say about the other features of the app because it is a classic wallpaper app, however one thing we want to emphasize is that the selection of the wallpapers is one of the very best we’ve ever seen. There is rarely a bad wallpaper, every single wallpaper is tastefully selected and it is in HD or Ultra HD. The app is light, frequently updated and simply it is a great database of amazing wallpapers. Certainly one of the best for Android. Get it for free on Google Play and make your Android device more beautiful today. Every day we here about many new apps that are very useful and of course we immediately share them with you. 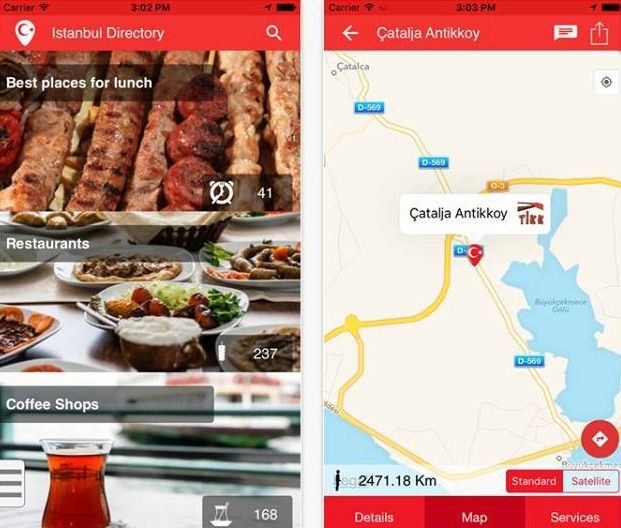 Recently we found out one of the best organized and most helpful travel apps - Istanbul Directory. Travelling to Istanbul has never been easier, you can find any place you want to visit and even see the costs you will make there. Istanbul Directory provides with tons of information about local places that are suitable for visiting. With this app you can easily find coffee shops, places to eat, markets, malls, bazaars, ancient mosques, Ottoman houses and other interesting places to visit. The places can be found in the search bar with only typing the keyword or try searching by categories, ratings, districts or nearest places. When you find the desired place, you can also check the prices, transportation to there and directions, many photos and contact information. There will be tons of tips and tricks that you will find very useful. Locate places on the app’s map with supporting the GPS on your device. It comes in 3 different languages, live chats with visitors and live cameras in the selected place, the app is one of a kind and will make your stay in Istanbul much more fun and entertaining. It is available for free on both Google Play and the App Store. We know that the name of the app is familiar to you. The Tales of Donkey Ollie are very popular children’s stories and we are sure that your kids will love it. The tales are series of 40 stories based on the main character Donkey Ollie. Compatible with every Android device, now your children can enjoy, have fun and learn something from this amazing app. Donkey Ollie contains multiple stories. “The Lord’s Prayer” is a wonderful collection of stories and is divided in 10 different stories for your children. Another great collection is the “Names of God” which offers details of God’s personality and it gives the name to him, such as The Great Sheppard. 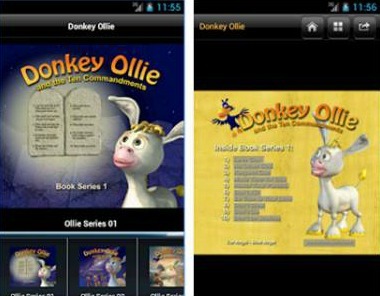 The app features the collection “Ten Commandments” and it is told through Donkey Ollie and his friends. It is the simplest way for your kids to learn the God’s ten commandments. ‘The miracles of Jesus” features ten stories that are telling the miracles of Jesus during his time on Earth from the Bible. The four series that this app includes are truly a blessing and the developers made a huge effort to make it enjoyable for any child. With neat and tidy interface, fun and colorful backgrounds, this app can reach out to children from all over the world. You can download it for free on Google Play. When we found out about this incredible app, we thought how no one has come out with this idea before. Happ – The Social Map is created by Happ Inc. and it is fulfilling the standards of an amazing social app. 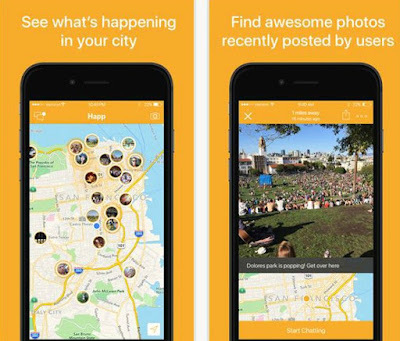 This local discovery allows you to see all kinds of photos and activities and know what is happening around you. What to do in NYC? No worries. Happ – The Social Map includes tons of features. The no registration is what we liked the most. You don’t have to sign up, you just have to post your first photo and you have a personal identity and others can see you. When posting your photo, you will need to post it to your location. That’s how people will see your experience and know what’s going on in their city as well. Chatting with people online on the map is also available on this app and you can find the active chats by the pulsing around the photo thumbnails. In that way we assure you you’ll get to know more people, share experiences and have some fun. With neat interface, the app is super easy to use and will definitely grow into your heart. It will show you all local activities and you will discover what’s happening within the city you live. Download this extraordinary app for free on the App Store. If you are looking for a fun game that will keep you entertained everywhere and anytime, here is the one that we highly recommend. 3Coins is created by Luply Apps and it has simple, but very addictive gameplay that will keep your mind sharp and your spirit challenged. It is one of those games that will literally glue your hands to your Android device and make your time worthwhile. The game is displayed in your phone’s full screen and its background is white, which is very soothing for the eyes. The gameplay includes three circles. Two of them are red and one of them is blue. The goal is to shoot the blue circles between the two red circles which are connected with a line. The shooting is done with pulling back the blue circle and then releasing it. You get one point for every time it passes the line that connects the two red circles. Also, the circle gets bigger and bigger with every passing through the line. If you lose the game, there is always a chance to restart it and try again. The red circles appear where the blue one ended with your previous shot. If you want to get ahead at this game, you will need some good strategies and then you can place your score on the leaderboard and earn more achievements. Time is running out, earn time with every hit. Download this amazingly addictive game app for free on Google Play. Image class Labeler is one of the top rated Android apps on Google Play in its category. The app is for technical users who are familiar with image labeling and want help with it. According to the customers, it has a simple set up and it is very user friendly. The developer - Alexander Farley, made a huge effort in making this app one of the most helpful Android utilities available on Google Play. With this app you will be able to manually create large image-based training sets for supervised classification algorithms (neural networks/deep learning). The app takes the URL to an index file which contains the links to the image set. Then, configuring the image set can be easily done by a simple step – serving a public folder that contains images. The serving is done directly with Apache. It will serve a default folder index. Your .htaccess file will contain this line: options + indexes. On the alternative way, the constructing and storing the index files can be done manually in the image folder and the image set configured with serving a public folder with Dropbox. You should know that this amazing app works with BMP and JPEG images, but it will most likely work with PNG, WEBP and GIF as well. This outstanding app is available for download on Google Play. If your old games are getting boring to you and you need a new addictive game that will literally glue your hands to your Android device, we offer you the best game app on Google Play – Cat Rat Dog Race. According to the customer’s reviews, it will be one of the best games for this year. This game a very cool gameplay and it allows you to play with your own character, which happens to be a cat. The goal of the game is to catch the rats. So, the cat chases the rats, but there is also a dog featured who chases the cat – you. 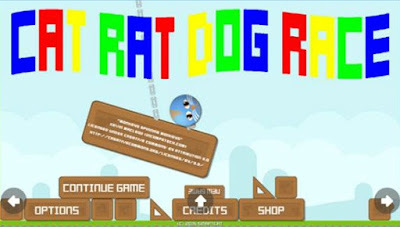 Chasing the rats, you will have to solve very tricky problems and try to move through many obstacles that will come your way. Also, you will have to escape from the enemies. There are multiple enemies: ghosts, giant mushrooms, the dropping bombs bat and the awful chain monster. Everything that happens in this game is set in light, like mountains and grasslands and also in dark, like the caves. You will be able to collect coins and open many more features this game offers and also compare your high scores on the app’s leaderboard. Get more achievements with this amazing game. Download it for free on Google Play. Battery saving is a land questionable solutions. It truly is difficult to find an application that actually saves you battery since most battery saver measures are manual, including turning the brightness on your screen down, turning of mobile data when you’re not using it, and other tried and true methods. One of the very best you can find on Google Play is certainly the Battery Saver produced by Android King. Who can count the time that we’ve ever spent waiting in line. How many hours have we spent waiting to get a ticket, get a table at a busy restaurant, talk to a customer service representative or get into popular discotheque? Every time the waiting is just more and more frustrating. However, there is a solution, an app, that can remove all of those frustrating moments, or at least, decrease them significantly. 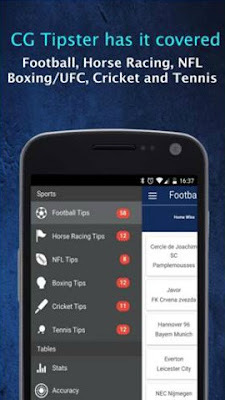 Downloading the best betting app available on Google Play will get you access to many betting events. Soccer Tips / Sports Tips is one of the top rated apps in its category and all of the customers simply love it. Containing a neat interface and tidy menu, this app offers you a secure and fun betting experience. This app has predictions all year and it covers 200 leagues and more around the world. The predictions are being produced with a well built algorithm, so they are 80% accurate and will help you win any bet you make. The 5 star tips of the app cannot be beaten by any other app, according to every user. The betting tips are made with a special formula that is improving each day so it can be even stronger. The app features a free version and a version you need to unlock. With the first one you get the silver soccer tips and the soccer stats (league table, home table, away table, last 5 table, last 5 home table, and last 5 away table). Pushing the notifications for football betting prediction is also available in the free version. Unlocking the app will allow you to get gold soccer tips and follow the UK Horse Racing, NFL, Boxing, UFC, Cricket and Tennis. Share the tips with your friends and family via Facebook, Twitter, Whatsapp, e-mail, texts, etc. Download it for free on Google Play. We all usually hang out with people who have similar interests, skills and talents. Of course, there will be times when we need to get things done and find the experts in that field. Whether is a website maker or a photographer, looking for suitable people to do some job we need can be difficult. No need for worries. Here we have the perfect app that will get things in its own “hands”. Besides the people search, we need someone who we can trust and can perform the job well. Felp provides with many features that can help you do all of this and also to advertise your own personal skills. Connect with more people and let them know what your talents are and get yourself hired. 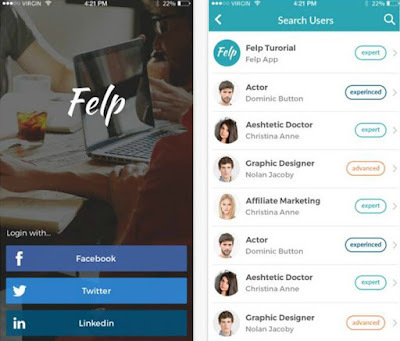 The connections are made with people from your social accounts, like Facebook, Twitter or Linkedin and with Felp they can turn into your potential clients without even self promoting. List and describe your skills. Find the people with skills you need with searching through this amazing app and look at their lists above their name and their level of expertise. Felp requires iOS 7.1 or later and is compatible with iPhone, iPad, and iPod touch. With its beautiful interface and design, this app will help your skills to be discovered. Share the app with your friends, because the more people use it, the more effective it will be. Download it for free on the App Store. 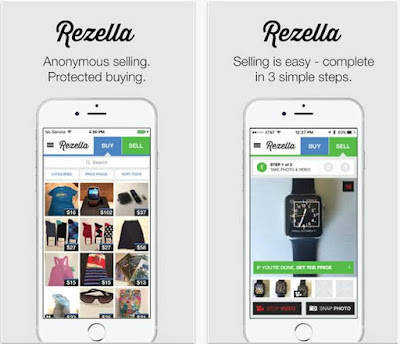 Searching through the shopping category on the App Store, you will find an incredible free app that is called Rezella. Its developers – Rezella, Inc. have created a buying and selling experience that is safe, secure, and hassle free. Forget about all of the boring buying and selling stuff in the stores, you can have fun with this app downloaded on your iOS device. The app requires iOS 8.0 or later and is compatible with iPhone, iPad, and iPod touch. It is the most private and secured apps you have ever seen. With its simple interface, it will allow you to buy or sell items online within 60 seconds. The best thing about this app is that you don’t have to create a profile, you have all the privacy you need. There’s no need for social media logins, meeting with strangers. Just dropping and picking up the packages at FedEx. All of the payments go through the secure and reliable platform of the company. If you want to sell an item, just take pictures or videos of it, pick a name and a price and describe and categorize it. The buying is a little bit different, meaning you will have to create a profile and just search what you desire on the market by filtering by price or category. Then, just click the buy it button and wait the arrival of your item. This extraordinary app is free for download on the App Store. Today we have the pleasure to present to you this creative app called Call Me. It is brought to you by the developer JJBrooklyn and it is one of the top rated apps in the lifestyle category. If you are an Android user, this app will offer you to schedule a fake phone call and pretend it’s somebody important and walk out of whatever awkward or boring situation you’re in. This amazing app can be of help if you want to step out of a meeting or get out of a bad date. You can use it during negotiations or add some urgency to a discussion. Call Me does not actually place a real call on your device. The call will not be listed as in upcoming call from someone because it is a fake one. The app doesn’t require any wireless network and it will never use your mobile service provider. 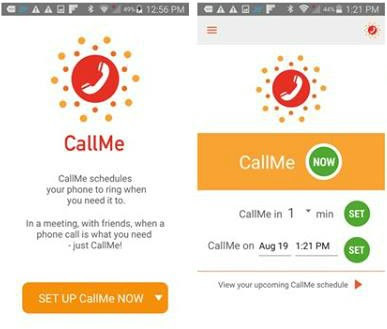 This app will trigger your phone to ring as if you were having a real call. It contains a great feature – you can choose whenever you want your phone to ring and also, whose name to appear on the display. The calls from Call Me look and sound very real to other people around you, so no one would know that it is actually a fake call. It is very effective and easy to use Android app. You can download it for free on Google Play. App Review - Can You Guess the Movie?